There’s a long and not especially interesting story behind my decision to do this piece in colored pencil. I won’t bore you. Mostly though I blame my friends and family who have given me many sets of colored pencils over the years, none of which I’ve used until now. 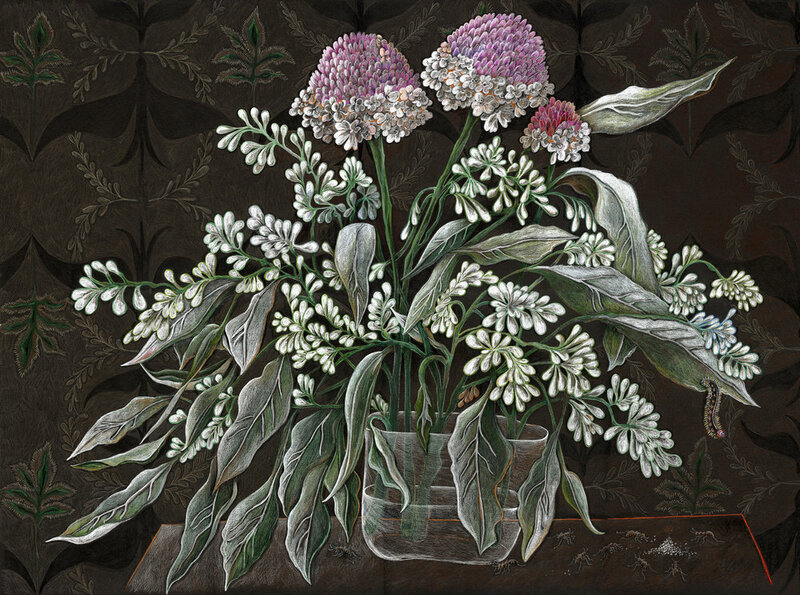 This floral still life is a reprise of a portion of a previous painting and features an arrangement of eucalyptus and thistle. The eucalyptus leaves fall softly around the bowl, buds very white. The bright pink thistles stand tall. The wallpaper pattern of subtle doves and garland makes a background. Someone spilled some sugar on the table. The ants are busy and happy. One may be whistling. A caterpillar seems interested. This drawing is 30” x 22” on black Stonehenge paper. I used Prismacolor pencils which were a surprise and a delight. They are soft and waxy and they blend and cover well. And, lucky for me, they don’t smear if you brush a sleeve over the work. I think there will be more pencil work to come. And I’m offering free shipping on all domestic orders from March 8 through March 12. No code necessary. Finishing up a morning run I turned the corner into my driveway and there was a buck. I didn’t startle him in the least but he surprised me a little. He was very big. He looked at me and calmly kept on foraging. I can go most of the year without seeing many, or any, bucks but there he was. I’ve put him here, in a slightly different scene. Here it’s nighttime, the moon is full, and snow is beginning to fall. 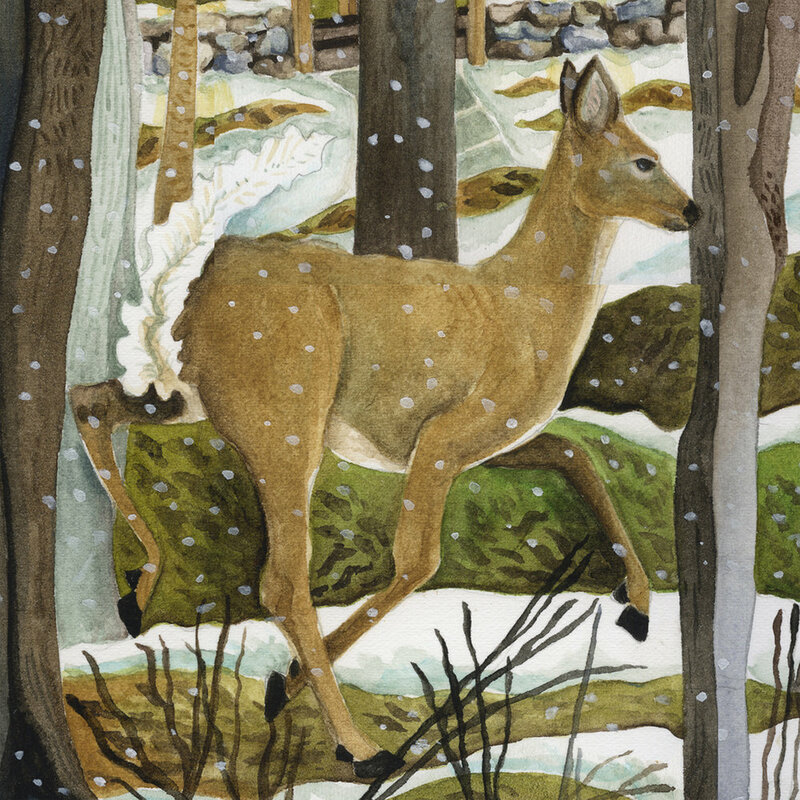 I’ve added a doe. The green house is mine. The red barn is not mine although it seems to make regular appearances in my work. The helter skelter arrangement of my neighbors homes is fairly accurate, typical in a rural setting. No straight lines or right angles here. I realize that Lily of the Valley aren’t the first thing that comes to mind when you think of the holidays but I was in the mood to paint some flowers. I picked these in the spring and put them in the mottled blue vase and took some photos for “future” reference. It turned out that November was the “future.” I like this little vase, a gift from long ago that comes in handy for small things. The wallpaper is loosely based on a pattern design that I created in Illustrator. I don’t know where the red tiles came from but I think they look alright. Maybe a little Christmas-y. Thanks to all of you for your continued interest in my work. I am grateful. I wish all of you the happiest of holidays, whatever those may be. “Lily of the Valley,” watercolor, 10” x 12”, on Fabriano paper. Prints of this painting are available in my Etsy shop. FREE SHIPPING on every domestic purchase through December 21. “Lily of the Valley” detail. This is a story of two escapees, donkeys that belong on some neighboring farm, that I see from time to time under Dan’s pear trees. The donkeys are very entertaining and thoroughly enjoy their bit of freedom. One is usually standing calmly, watching, while the other loves to roll around. I have never learned who they belong to. The pear trees have been untended for years so they’ve gone wild looking and the pears are almost inedible. I say almost because another neighbor has delicious success poaching them in red wine and bottling them for Christmas gifts. Dan’s little shed is in the center and there are Queen Anne’s Lace in the foreground and fallen pears in the grass. I added the two cavorting bear cubs and the watchful momma bear after finally spotting them in the woods after everyone I know had already seen them. Wouldn’t you know I’d be the last one. 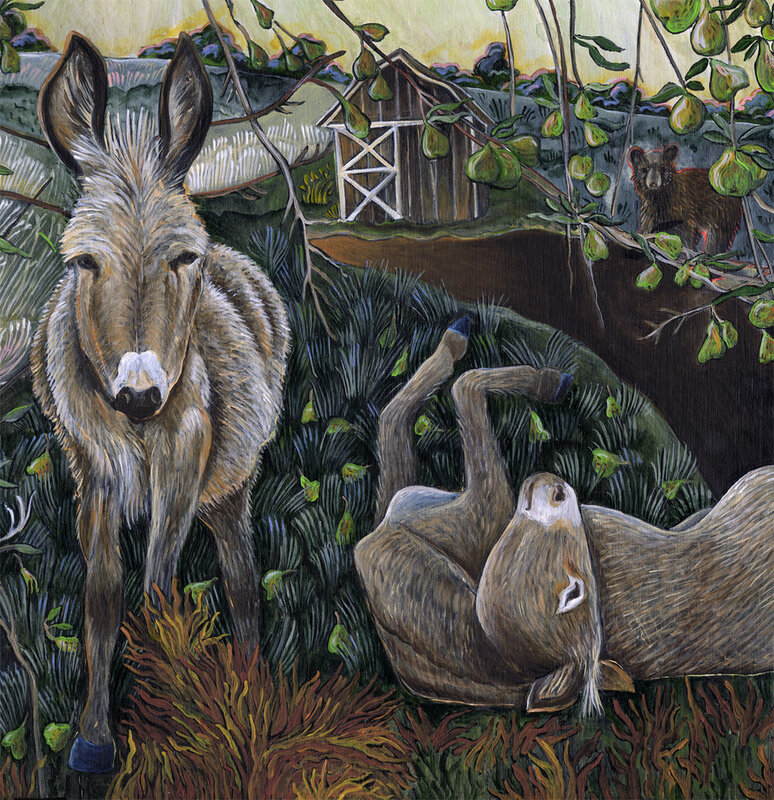 “Donkeys and Pears”, 20” x 16”, acrylic on panel. 25% off on all orders. No code necessary. Below are more details of the painting. Thank you for following along! This scene is one that I see most mornings. Woodland, farmland, silent deer and fawns, turkeys complaining with jakes and jennys trailing, chattering squirrels in the trees. Birches, willows, a pond with frogs and lily pads. You would be able to see all of this too but you won't be able to see the ghosts. Only I can see them. Behind the birches is the memory of a favorite tree that had to come down last year. And off in the upper right corner are Chester and Elmer, a horse and a pony, also lost but still running. This is my newest piece. “Ghost Story,” acrylic on board, 24” x 18”. Catalog from the Radius 50 exhibit and “Vultures at High Falls',” the accepted painting. I have a bit of news. I have a painting, “Vultures at High Falls,” in the annual “Radius 50” show at the Woodstock Museum. The show features what the jurors feel is the best work from within the 50 mile radius surrounding the Museum. Twenty nine artists are represented. The opening reception started with a gallery walk where half a dozen of the artists in the show (Not me. Stage fright.) spoke briefly about their work. I’m thrilled to be a part of this interesting, talented group. If you happen to be in the area the show runs through the end of September at the Woodstock Artists Association Museum on Tinker Street. "Ghost Story," acrylic on board, 24" x 18", $2200.00. I've also added more prints to my shop, including one of this painting. The Storm and A Show! A funny thing happened when I started this painting. The sky took over. I had every intention of showing a garden on a sunny blue sky day but, as you can see, that's not what happened. I've never before had the feeling that I wasn't completely in control of a piece. When my brush began making those dark churning clouds it crossed my mind that I could make the sky brighter and clearer but something kept me from doing it. In the end I was glad that I let the painting have its way. So a storm is definitely coming. Trees are blowing sideways, blossomed branches are tossed, a curtain flies from a window, a bell on a gate rings and rings. Milkweed, ferns, wild roses, and spider wort are tangled. The stream is rushing into the pond and the ducks are having second thoughts about their swim. The deer are heading for shelter, a turtle seems to have found some. And if I know that dog she's about to be frightened when the thunder starts. The stone house looks safe and welcoming. I think someone's about to get dinner going. "The Storm," acrylic on panel, 24" x 18". This painting has sold. I have some news too. I have had three paintings accepted into a juried show at the Woodstock Artists Museum. The show is titled FOCUS: Surveying the Landscape. I'm very happy about this. It's the first juried show for me and my paintings. The show runs from July 21 through August 26. I'll be at the opening reception on Saturday, July 28 from 4 to 6pm. I'd love to see you if you happen to be in the area. I have several new prints in my Etsy shop. Everything is 20% off starting today, July 20, and running through Monday, July 23. Handmade frame courtesy of my brother in law. It was one of those early spring days when the air is cool and so refreshing. Maggie and I were walking on the trail. I was humming something, Maggie was sniffing something. We heard a strangled honking and a crashing and an enormous, angry goose came charging at us from out of the marsh. The goose, wings spread, breast inflated, came straight for Maggie who looked to me for help. I grabbed a stick and managed to get the goose, who now had a mouthful of Maggie's fur, to back off some and Maggie and I ran. In the wrong direction. There was only one way back to the road home and we would have to pass the goose again to get to it. "True Story," acrylic on board, 24" x 18". In the last photo I'm preparing to frame the painting. The beautiful frame was made by my brother in law and suits the image as well as my home. You can see the spacers that I've used to center the painting in the frame. I'll be keeping this painting although I haven't decided where exactly I'll hang it. Maggie is getting older, fourteen soon, and if you knew her you'd see that I have captured her pretty well. If I do say so. I have photos of her but this portrait and the incident are special to me. Spring has been very slow in arriving here in the Hudson Valley. I know this is true of many parts of the country. But even if there's still snow on the ground it seems a sign when the market starts to sell tulips. I'm especially fond of the pale pink ones myself and I can never resist. In a way this is a reprise of an earlier watercolor of pink tulips and peepers; tulips in the foreground, the little frogs hanging on to the stems and leaves. 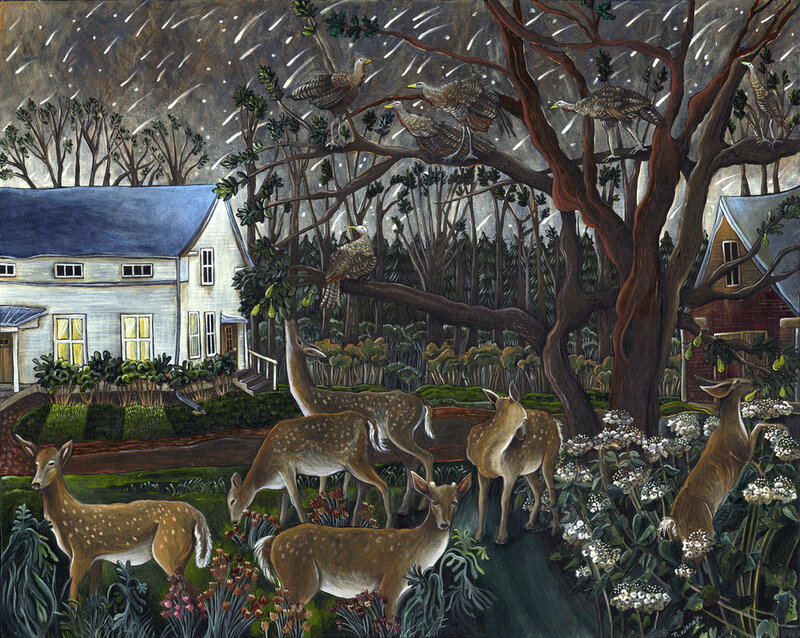 But in this painting, beyond the flowers, is my rural landscape and a little drama that unfolded. Maggie was attacked by an angry Canada goose who came out of nowhere. Luckily Maggie escaped mostly unharmed. This is a true story. The painting, "Pink Tulips and An Attack," and prints of this image are available in my Etsy shop. I've added several more prints of past paintings to my shop as well. Wednesday, May 2. No code needed. "Reception detail." Acrylic on board, 20" x 16". It's been a while, I know. When I wrote to you last I was about to show my work at a local library. Which I did. The opening reception was very nice, better than I had expected. I'm pretty happy to work quietly most days and I'm not a party girl in the least so I was half dreading the reception and the requisite talking. But everyone who came was so lovely, old friends and new, and I was barely uncomfortable at all. In the end ten of the eleven paintings sold. After a little down time I'm back to painting again. The detail above shows the flowers I had on the table at the reception -- thistles and some sort of eucalyptus. I've reopened my Etsy shop. To kick things off all prints are 20% off. The sale will run from today, March 22, through March 27. No coupon code is needed -- Etsy will show the mark down on each item. I don't have a lot of inventory yet but I'll be adding as time goes by. If there's an image that's not there that you'd like a print of please let me know and I'll see what I can do. I'm now having an outside source do my printing. Making the prints myself, as I did in the past, is pretty time consuming and I want to focus as much as possible on my painting. Meteor Showers. One more for the show. A couple of years ago my husband and I decided to watch a juicy meteor shower that had been predicted. Coming from Chicago, with all of its ambient light, we'd never had an opportunity to do this. But the wide open skies of the valley gave us a good opportunity. Here's my depiction with some license taken. In reality this happened at 2 am on a frigid January morning. We bundled up and took blankets and quilts outside to lay on and wrap up in. Maggie took one look at this and walked right back inside. Here in the painting I've made the night a warmer one with turkeys bedding down in the trees and deer eating my plantings. In the sky is a ridiculous display of stars and flying meteors, a slight exaggeration. This is the final piece for my show, number eleven. If you're interested in purchasing this painting please get in touch through the contact page or send me an email. And if you're near Gardiner, NY between noon and 2pm on November 18 stop by the Gardiner Library. I'm having a small reception and would love to meet you. For the past ten months or so I've been busy working on new paintings for my November show at the Gardiner Library. I've completed ten - a visual representation of my beautiful surroundings. They are a timely reminder of what we can lose if we're not careful. If you're nearby you can check out the show or come and meet me at the reception. The show runs from November 14 through December 30. Saturday, November 18 from 12pm until 2pm. Again, If you have questions please email me via the "Contact" page or at natalie@nataliewargin.com. Thanks for taking a look! "Button Plants and Wood Ducks"
This is my latest painting, "Button Plants and Wood Ducks." It's a 24" x 18" acrylic painting on birch board, my largest to date. My neighbor's section of the marsh that we share has a profusion of Button Plants. They are gorgeous things with orb-like flowers that start out chartreuse and burnt sienna and bloom into balls of tiny white blossoms. The marsh is a very busy place. I see a pair of wood ducks every spring; later I see their ducklings. The deer troop through at cooler times of day, eating breakfast or dinner. And lately I've seen a fisher. He's up there in the tree. He may have his eye on the ducks. Fortunately the mourning doves are hidden. There's red osier dogwood blooming at the bottom along with pink water pepper. It looks like someone's home at the green house. This will be my last blog post for a while. For the past few years I've entered an embarrassing number of art shows. I have never had my work accepted. After a career in graphic design where I had to bid on jobs I grew a fairly thick skin, rejections rarely bothered me. Even so this year I decided to end the self-flagellation and stop submitting to shows and paying strangers $35 or more each time to consider my paintings. And guess what? Out of the blue I've been offered a solo show at the Gardiner Public Library. It's ironic. When I had my design business in Chicago my second client was the American Library Association. They were my client the entire twenty years that I had my business. I have always felt good about all the work I did to promote libraries and reading and now here's a beautiful, new library in a lovely little town offering me a show. You've certainly gathered that these paintings take me a long time to do and while the show isn't until November 2017 I feel I need to focus. The blog will be on hiatus. I'm also closing my Etsy shop, the fewer distractions the better. I can't thank you enough, all of you who have followed and supported my efforts. I'll still be around and if you're interested in seeing what I'm working on you can follow me on Instagram. As a "Thank You" please take 50% off any Etsy purchase. Sale runs from Friday, September 2 through Sunday, September 4. After September 4 my shop will be closed. Earlier this year, in the spring, I managed to get a few pictures of forsythia in bloom. Shortly after taking these photos the weather turned very cold and most of the blossoms around here were lost to frost damage, turning brown and shriveling overnight. It really was a shame; the burst of yellow forsythia is so short lived to begin with. I thought I'd paint them but I wanted more in the piece than the flowers. The wild turkey population has been down the past couple of years. It's rare that I see a flock walking across my yard or peeking in my studio windows. Last year hunters were only permitted to take one instead of the usual two but I wish they'd stop hunting them altogether. A few weeks after I photographed the forsythia I was passing a field near my house and I saw a line of turkeys, all with tail feathers on display. So I put them here, with the spring flowers. I've been posting my work-in-progress on Instagram and I remember showing the two turkeys on the right and commenting that we all knew who the alpha was. My thinking was that the large puffed up bird with all of the fancy plumage was the one but now, looking again, I think I may have been mistaken. That one on the very end who's not showing off, who's slightly taller than the flashy one, who seems to be locking eyes with the flashy one may be the reckoning force. Is the flashy bird pulling his head in slightly? You may have noticed that the bird on the very end is a female. I like when the dynamic in my paintings surprises me. I'd hate for you to miss the lively black squirrel over on the left. I only recently saw this one and I wanted to make a note of it since black squirrels are a little unusual. It ran up ahead of me for a bit while I was on the trail -- silky, shiny, and black as anything. This is a long horizontal watercolor and gouache painting. 17" x 7" (43cm x 18cm). "One Morning" + FREE SHIPPING! That's my neighborhood to the left of the big tree. My house is the eyebrow colonial more or less in the middle. The one with the intelligent dog in the yard. This is what a cool spring morning is like. There's a bit of woodsmoke coming from the chimneys. A lot of rain has fallen, turning things that special early green and the blossoms are beginning to bloom. Along with the woodsmoke is the scent of wild pink honeysuckle. The dogwood is especially showy. There's a breeze tossing the trees a bit. The Catskills have my back, the sky above is overcast and cloudy. Maybe there will be more rain. To the right of the big tree is a spot that Maggie and I discovered while walking in the woods behind our house. We like to follow the deer paths and on one particular day we came to a spot with seven indentations in the dry fallen leaves. I knew what it was as soon as I saw it, the place where the deer sleep. The deer were gone, of course, but I've added them here. All sleeping peacefully. All but the one keeping watch. The topsy-turvy arrangement of the houses and barns on the left surprised me but it is accurate. I wasn't sure about that crazy blue fence and didn't think it would survive the painting but there it is. It's only an invention but it grew on me. This is a 16" x 12" acrylic painting on cradled birch board. Code expires on May 31. When I walk down the trail along the Cottekill swamp a flying blue heron is a fairly common sight. I might initially glimpse one sitting on a limb or a fallen tree but once the bird sees me it usually takes off. They are very shy. I've exaggerated the bird's blue coloring in this painting. The true color is more subtle, more of a gray, better camouflage. To me they remain a startling sight when they fly off. They are large and ungainly and their long thin legs stretch far out behind them. Beautiful nonetheless. Snakes live along the swamp's edge. They can be big and startling as they slither quickly into the water. Even shyer, I think, than the herons. Maggie is intrigued but I quickly shoo her away. I haven't learned yet which snakes are poisonous. Since it's early in a cold spring there's not too much growing yet. Mostly just the gorgeous emerald swamp cabbage. This painting measures 7 x 9 inches (15 x 23cm). There's a small but very special shop one town over. It's the perfect place to find a gift or to get a wildly colorful bouquet and I was lucky enough to receive some of their fancy flowers for my birthday. Scarlet poppies, purple-indigo delphinium, lime-light hydrangeas. I thought I'd paint them even though the arrangement was a bit more colorful than my usual palette. Here they are. Somehow a couple of sparrows got into the picture. If you know me at all you know that I can't just leave things alone. Birds and animals tug at my sleeve every time I pull out my paints. I happen to have a soft spot for sparrows. Small and unassuming, quietly colored, they are hearty and tough. I had some space so in they went. Spring is coming, that's for sure. I look out my window or ride down a road and flocks of birds are gathering and singing like it's some big happy family reunion. Dozens of starlings flying in an abstract formation that thins and swells and curves. Dozens of robins in my yard, hopping and pecking at the grass and filling the yet to bud flame bushes. Driving down 209 recently I looked over to the fields where Gill's Farm has been growing exceptional corn for decades and I saw hundreds of geese. Hundreds. I have never seen so many birds all in one place. Maybe they were resting or maybe there was something tasty that geese just love left over from last season. All I know is that it was an impressive sight. I've painted a version of what I saw and I admit that I took some license. The geese I saw were still and if there were other animals I didn't see them. I've moved the creek. The Esopus is actually a couple hundred yards away. I haven't seen any turtles yet this year. And these geese are flying which would probably be a wise decision if there were foxes around. This is a watercolor and gouache painting, slightly horizontal, 13" x 12". One of the best things about having a nosey dog is that she makes me wait. While I don't like to let Maggie spend an eternity sniffing the same spot I do feel that since the walk is for her as well as for me she should have some time to explore. She noses around, I look around. A couple of weeks ago we were on the road near the Cottekill and Maggie stopped. I looked up at the tall bushes in front of me on the edge of the creek and saw a small nest. It was abandoned, of course, almost lost in the branches and I would have missed it but for the dog. On the ground were some hydrangeas, dry and papery, a pretty straw color. Here's the nest, caught in a tangle against a clear blue sky, hydrangeas below. This is a small painting, 4.5 x 6 inches. It's available in my shop. In a way this is a study for a larger painting that I'm planning. I've been wanting to paint sleeping deer ever since Maggie and I discovered the place in the woods where several of them sleep. We were walking beyond the ridge behind our house -- there are hundreds of wooded acres back there -- and we found a well-sheltered spot with eight hollowed ovals in the snow. I figured out what they were fairly quickly and the realization was accompanied by my usual "Wow!" There were trees all around, tall pines that blocked the sunlight. In fact, the soft light filtering through the needled branches almost looked green. The place was secluded and felt safe. Here they are, the resting deer, protected by the rare red tree. The fancy house in the background is inspired by Sunnyside, the home of Washington Irving here on the Hudson River. The Hudson banks were favored by many influential people, close enough to the city but just far enough away to be a retreat. I am having a big birthday on Sunday. A milestone. I invite you to join in my celebration. I am offering 25% off anything in my shop including original art. This sale will run from Saturday through Sunday, February 13 -14. I have to face it. This winter here in the Hudson Valley is a dud. I know, I know, there's still more winter to come but I can recognize a pattern when I see one. This one says "No Snow." And I love snow. Recently I was out with Maggie in the gray afternoon thinking a pretty bouquet might lift my funk when I realized that I didn't have to go over to Green Cottage for flowers. I could pick an interesting assortment of drying things; leaves of red and brown, gray-brown Queen Anne's Lace, and some of those other things, all appropriately decomposing like my mood. But I felt my mood improving. You can see in the photo of the things I chose that they made a pleasing arrangement. I took them home, took that photo, and was about to place the weeds in a vase when I noticed all the little dust and seeds falling. I began to sneeze wildly. The bouquet ended up back in the woods but I had an image and an idea for a watercolor. The drying bouquet is hanging, as you can see, tied with a ribbon. I added the falling dust and seeds just for fun. There are goats in my vicinity but not right next door. The view out the window of goats in the snow is wishful. And shipping is free on any order with this code, good through January 31. Subscribe to my blog by clicking here!